First up this week is one of the coolest things I’ve seen in a long time: the world’s largest computer made out of dominoes. A computer made out of dominoes?! you say. How?? The Domputer, as it’s been called, was the great idea of mathematician, teacher, and entertainer Matt Parker (see a previous post about Matt here), and he and many volunteers built it at the Manchester Science Festival at the end of October. Matt and some of his teammates testing domino circuits. At its very, very basic level, a computer is a machine that does calculations in binary. You input some sequence of 0s and 1s by flipping signals on and off, and your input starts a chain of electrical communications that results in an output of 0s and 1s. Most computers do this with electrical circuits. But it can also be done with dominoes – sending an “on” signal means flipping a domino over, and sending an “off” signal means not flipping a domino, or having a chain of falling dominoes that becomes blocked and stops falling. Matt’s Domputer does something very simple: it adds numbers in binary. But, as you might imagine, it was extremely complicated to build! 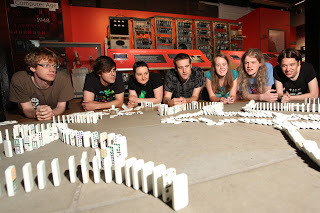 According to the Manchester Science Festival Twitter feed, the Domputer used about 10,000 dominoes and would take about 13,600 years to do what a normal processor could do in a second. Wow! Here it is in action. It messed up on this calculation (9+3), but succeeded in later attempts – and is fascinating to watch nonetheless! Next up, we’ve written about mathematical knitting before (remember Wooly Thoughts and the prime factorization sweater? ), but here’s a great site I recently found made by mathematician, knitter, and dancer Sarah-Marie Belcastro. This site is full of articles and about and patterns for all kinds of cool mathematical objects – like Klein bottles (which make great hats, by the way)! 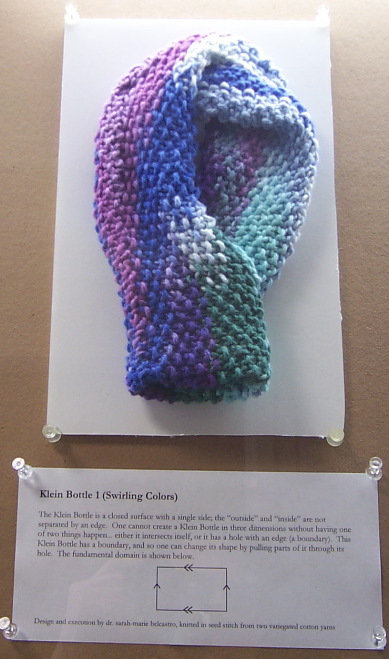 In her post about knitted Klein bottles (and all of the other objects she makes), Sarah-Marie not only describes how to knit the objects but a lot of mathematics about them. I don’t know about you, but I always find mathematical ideas easier to understand when I can make models of them, or at least read about models being made. Sarah-Marie does a great job of blending mathematical descriptions with how-to-make-it recipes. 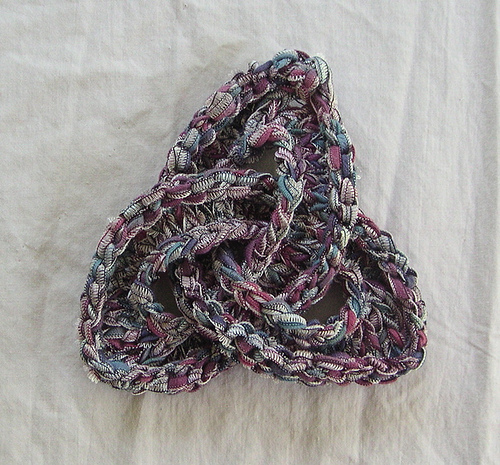 Some other patterns that I love are Sarah-Marie’s 8-colored two-hole torus pants and this knitted trefoil knot. This post is positively amazing!!!!! I love dominos and I love to knit. Nov 26 12′ is something that I recommend. With the domputer how many different variations total can it come up with? Was the set-up the hardest part, or actually conceptualizing it? Hi, Cristopher! It took a very, very long time to figure out how to set up the domino computer. A few of my high school students did it– they used a lot of trial and error and learning from mistakes! 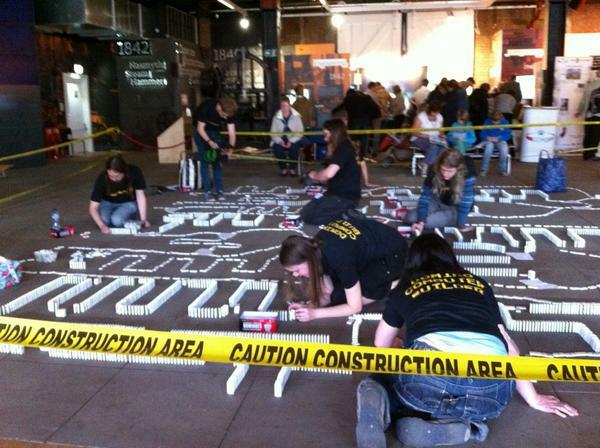 I think we used almost 2,000 dominoes. Thanks for the great questions! This is an amazing post. I never would of thought of “domputer” or a “domino computer”. I am still mind blown on the techniques used for this. Also, how long did it take to set up everything and make sure it was correct?